OmniPlan is designed to help you visualize, maintain, and simplify your projects. Break down tasks, optimize the required resources, and monitor your entire plan—all at a glance. 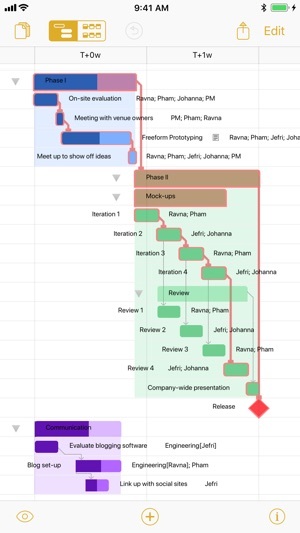 Visualize your project’s tasks in a Gantt chart or Network diagram. Automatically sync projects across multiple personal devices or collaborate with your colleagues and share every detail. Run Monte Carlo simulations to forecast milestone completion dates with varying levels of confidence. OmniPlan helps you manage projects that are as simple or complex as you need them to be—without the complexity. 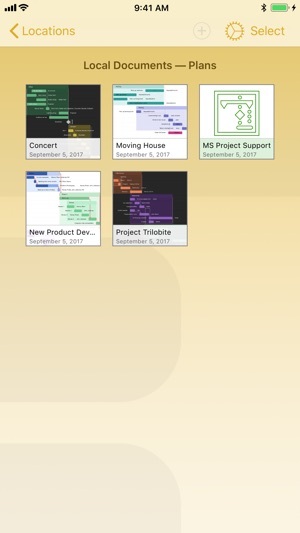 • Gantt Chart — Add groups, tasks, and milestones to your project and watch OmniPlan transform the timeline of your project into a beautiful Gantt chart. 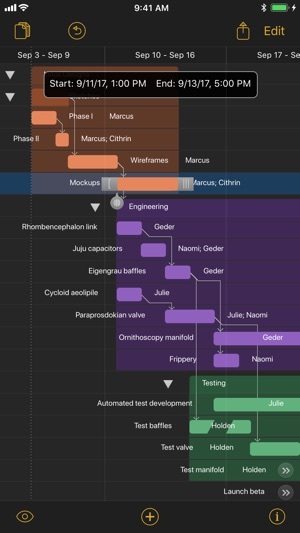 The project Gantt chart graphically shows task durations, start and stop times, dependencies, resources, or resource usage by task, all on a timeline. 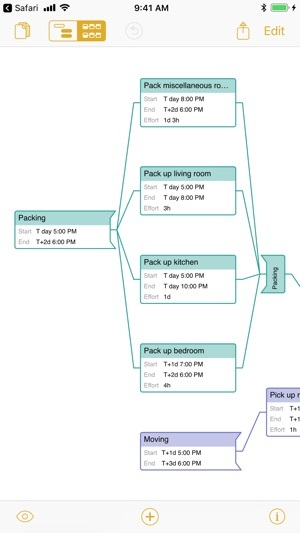 You can visually edit tasks and create dependencies by connecting them in the Gantt view. • Network Diagram View — An elegant and easy way to rapidly prototype and visualize your project’s flow as a network diagram of nodes connected by dependencies. • Resource Leveling — Identify bottlenecks in your project and distribute workloads fairly and efficiently with OmniPlan’s resource management. • Leveling Priority — Define leveling priority for tasks in your project. • Violation Resolution — If your schedule has a logical impossibility, OmniPlan will find it and suggest the best course of action to restore order. • Catch-Up and Reschedule — If everything is going as planned, bring the completion percentage of every task (or just the selected tasks) in your project up to today’s date. If you have tasks which were planned to be complete by now, but aren’t, quickly reschedule them. • Meeting Task Type — Specify if multiple resources need to work on a task independently or simultaneously. 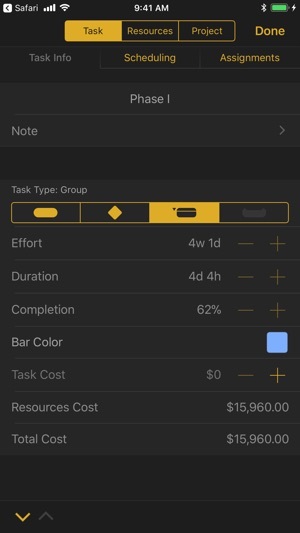 • Unlinked Duration and Effort — Set different values for a task’s effort and duration, then let OmniPlan crunch the numbers for your resource assignment percentage. • Multiple Baselines — Take snapshots of your schedule, then compare them as your project progresses to make sure you're still on track. • Critical Path — Flip a switch to highlight tasks that have the biggest impact on your deadline. • Display Off-Hours — Display all off-hours, holidays, and weekends in the Gantt chart. • Change Tracking — Keep tabs on and review the changes you've made in your project so far. • Microsoft Project Import/Export — Open Microsoft Project® 2016 or earlier documents directly in OmniPlan and export to Project 2013. • Monte Carlo Simulation — Run multiple simulations in seconds to forecast milestone completion dates with varying levels of confidence. SUPPORT: If you have any feedback or questions, we'd love to hear from you! The Omni Group offers free tech support: you can reach us by email at omniplan@omnigroup.com, by phone at 1-800-315-6664 or +1-206-523-4152, or on twitter at @OmniPlan. • Support for New iPad Screen Sizes — Added support for the new iPad screen sizes and hardware changes. 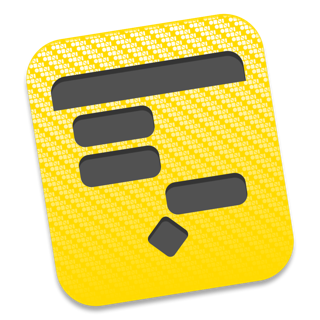 • Drag & Drop — Fixed a bug that could cause tasks to be created with blank task names when adding tasks to an OmniPlan project via drag & drop from another application. 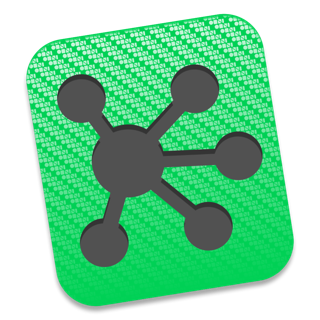 • Publish & Subscribe — Fixed a bug that sometimes caused sync to stop working when one of the participating Mac clients crashed. • Inspectors — The “Normal Work Hours” calendar title is no longer cut off in the Inspector when using OmniPlan on an iPad. • Localization — “Auto-Refresh Interval” in Publish & Subscribe section of the Project Inspector is now localized. • Localization — Siri Shortcut titles are now localized. • Stability — Fixed a crash that could occur when resolving conflicts in a project. App could have been helpful, but pricing is crazy. I don’t mind paying for a really useful app, but don’t want a second mortgage to be able to afford one... Just think what other software you can buy for less. Programs and games that take tons more to develop and have entire large companies behind them cost less than this. No thanks, I’ll just go burn $20 bills for fun. Love this app in my IPad Pro, great work guys! New share options make a great addition! Omni creates software, for decades, that is incomparable in attractiveness, usefulness, and stability. There is real intelligence and creativity in how they create apps. Having version 1 on my iPad made the free update to the Pro version easy, so if you've owned a previous version going Pro doesn't cost extra. The software is expensive, but the extensive time and effort this company puts into creating the best of the best makes it worth it. The new features and integrations are awesome.